I love this period, when skirts were huge and waists were tiny. It’s all an optical illusion really; the conical stays and the flat V-front combine with the huge hips to get that look. Custom made 1-piece dresses start from £350. I have made samples of various styles of Georgian gowns, available from my Etsy shop – similar available to custom order, from £450. All these gowns really need to be worn with panniers and sometimes a bum-pad – all of which I can supply. It also helps to get the look if you add as many petticoats as you can. The fit of one of these is really important as there is no ‘wriggle’ room, not even in the sleeves, so I tend to make these custom sized only: feel free to get in touch. It usually takes 4-6 weeks for a custom order, and that is if I am not booked up, so please allow plenty of time. I am based in Plymouth, Devon and can do custom fittings by appointment only. The classic 18th century gown is of course the sack back or Robe Francaise – like this coffee and gold coloured silk one. The loose pleats at the back were part of traditional French court dress, and the stomacher and lacing inside at the back of this gown make the size quite flexible. The English style, the Robe Anglaise cut with an ‘en fourreau’ back is a natural progression from the French gown. Like the sack back, it is cut all in one piece from neck to hem. The difference is that the pleats are sewn down by hand to create a fitted silhouette. The ‘Polonaise’ effect is when the skirt is worn looped up in the back – divided into 3 – like Poland apparently was at the time. 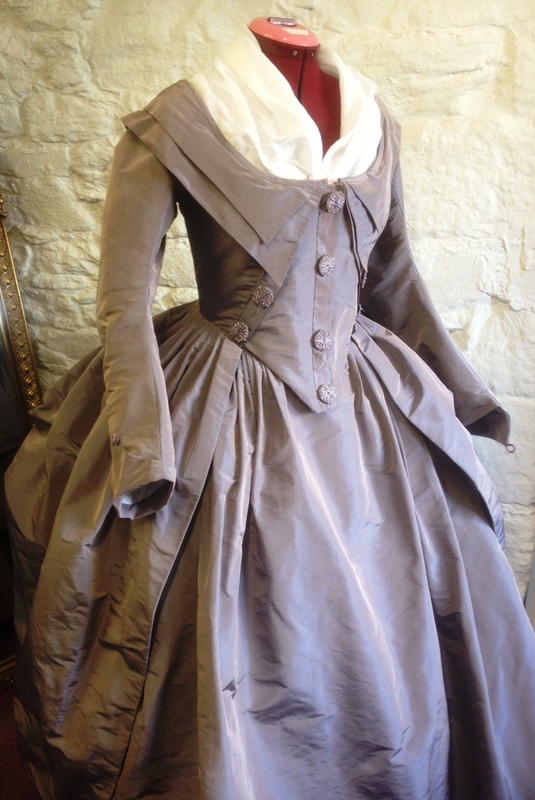 The robe Anglaise was also often made with a fitted bodice back and skirt with a waist seam.